Wondering how our canvas gallery wrapped art will look in your home? A customer recently sent us some images of the installation of three large canvases in their home. The canvas wrap on the left is 5' x 4' and the one on the right is 6' x 4'. Our prints go up to 55" x 96", so these are some the largest canvases possible! Depending on the size of your canvas, there will be different sets of bracing to ensure the frame is sturdy and will not warp. Based on the popularity of our mountain canvas gallery wraps, we've expanded our collection with over 50 stunning mountain landscapes. We have added images from the Alps, the Rocky Mountains, the Sierra Nevada Mountains, the White Mountains, and Maine Mountains. 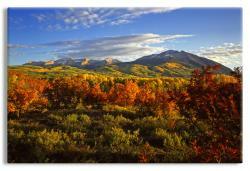 We have just added a series of new canvas gallery wraps featuring charming scenes of fall foliage from all over the United States. Our wall décor pieces feature various photographs from New England to Colorado that highlight the various stages of color changing in these regions. Home wall decorations from the Fall season convey feelings of renewal and richness. 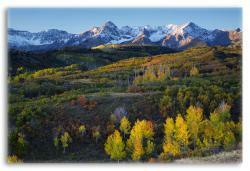 Check out the new Fall Foliage collection. Now through October 21st, save 22% off listed prices on any of our canvas gallery wraps. The October treat sale includes all sizes and options, including any special requests! Order early, the offer ends on October 21st at 6pm. It's a great time to get your holiday gift orders out of the way! We'd be happy to help you choose a gift - let us know if you'd like our expert recommendation. To activate the discount, use the coupon code OCTOBERTREAT at checkout. In order to make ordering easier and faster, we've introduced a new website. The improved site includes a search feature to allow customers to locate canvas gallery wraps more easily. It also includes several behind the scenes performance improvements in order to speed up browsing our collections. We'd love to hear what you think of our new look and feel. If you have any comments on the design or our canvases, let us know. To order a premium back, please indicate that you'd like this in your order comments at checkout. $12.50 will be add to your order. We've added over 50 canvases to our collection. Browse our New Gallery Wraps. You'll find some incredible new canvases in Utah, France, California, and Mountains. Our gallery wrap prices are among the lowest in the industry, so we rarely offer extra discounts. For the next few days however, we're offering an additional 20% off every order. This applies to every product on our site. Order early, the offer will end promptly on October 22nd at 5pm. Use the coupon code canvas20 at checkout. This special discount ends Thursday 8/27 at 12pm EST. Free Shipping on Home Decor - One week only. Free shipping on all orders placed through next Monday, May 25th. Father's day is right around the corner on June 21st! Dads love our beautiful gallery wrapped canvases to hang on their office or den wall. Check out some of our Mountain, Black and White or other Scenic images.